Investing Advice And InformationRetirement Planning and InvestingDoes the Federal Reserve Create Recessions? Does the Federal Reserve Create Recessions? I don’t agree with Paul Krugman on many things, but he’s right when he says that the Fed is culpable for causing the ups and downs of the business cycle in the United States. Milton Friedman argued the same thing. In this sense, both Krugman and Friedman — political opposites — are monetarists. The fact is that the Federal Reserve, whether under Paul Volker (1979-1986), Alan Greenspan (1986-2006), Ben Bernanke (2006-2014), or Janet Yellen (2014-present), has engineered a boom-bust cycle that has caused stocks to enter a bull market and sometimes a severe bear market. What is the Fed up to now? Based on the chart, the Fed still has adopted an easy-money policy. Not only are interest rates low, but the Fed seems to have backed up raising rates. Moreover, the supply of money is gushing, with M2 growing at a 9% clip. The Fed is still fighting a slowing economy (largely caused by the Obama administration’s anti-business attitude, higher taxes and more regulations). That’s bullish for stocks. 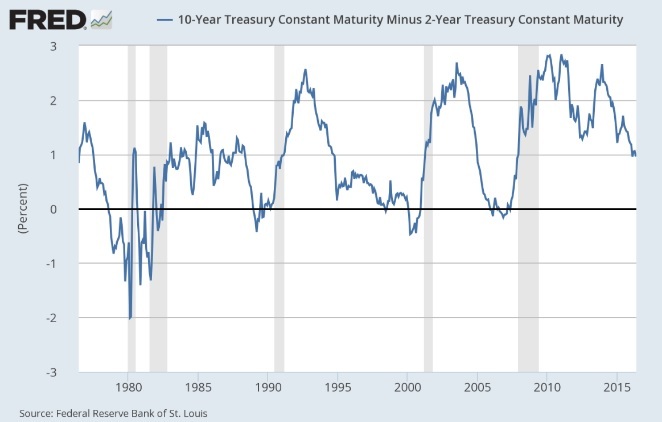 Only when the yield curve turns decidedly negative, as it did in 2000 and 2008, do we need to worry about another collapse in the stock market. That’s why I am ignoring all the Cassandras out there predicting a collapse in the dollar, a stock market crash and economic chaos. I remain 100% invested — and, I might add, beating the market. In fact, I can’t say enough about one particular Forecasts & Strategies investment, because of its generous monthly income stream and its best-of-breed business model. It’s been a favorite of mine for years, and the play keeps getting better. Follow this link for the full story. The biggest challenge for those who want to abolish the Fed is to find a legitimate alternative. Is it the gold standard, as George Gilder and Steve Forbes indicate? They will both be at FreedomFest to debate the issue. This is going to be a great debate, and I hope you can join us and hear all the action there, July 13-16, 2016, at Planet Hollywood, Las Vegas. My wife and I attended the bi-annual Cato Institute Dinner last night honoring the latest recipient of the Milton Friedman Prize for Advancing Liberty. The event at the Waldorf-Astoria Hotel in New York City marked the first night back from California for my wife Jo Ann and me after we taught the past semester at Chapman University. We were guests of John Mackey, CEO of Whole Foods Market, and we toasted the opening of his company’s first “365” store (which apparently was very well received by the public). It was a wonderful night celebrating “peace, prosperity and liberty,” the three keys to success and opportunity for humans around the world. Every other year, the Cato Institute gives a prize valued at $250,000 to an individual who has advanced liberty. Last night, the award went to Flemming Rose, the Dutch publisher who printed 12 cartoons of Muhammad several years ago, causing protests and death threats in Europe by radical Islamists. 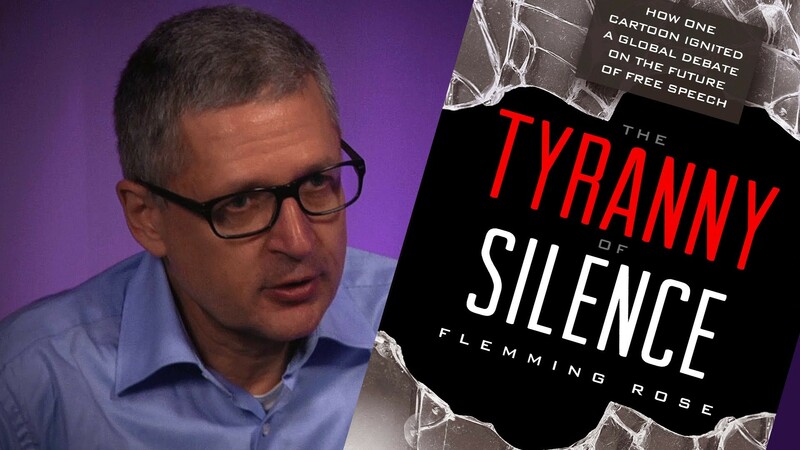 Cato published his book on the crisis, “The Tyranny of Silence.” Needless to say, there were a dozen security guards at the gala black tie affair. The list goes on and on, until society runs the risk that the exceptions become the rules. I am more in Arnott’s camp, but am interested to hear Joel Stern’s arguments. I respect both men, who are brilliant financial gurus and part of our top-rated three-day investment conference in Vegas, which includes top financial gurus Alex Green (Oxford Club), Keith Fitz-Gerald (Money Map), Bert Dohmen (Wellington Letter) and Peter Schiff (Euro Pacific Capital), who will engage in the big bull vs bear debate. The debate is not to be missed! I hope you will join me. FreedomFest is less than two months away. Now is the time to sign up. The “early bird” discount has ended but I’m extending it to all my readers. If you use special code FF16Eagle, you get a $100 discount on the retail price ($595 per person/$895 per couple). And bring a friend for only $300 more (FreedomFest is more fun with friends). To register, go to http://www.freedomfest.com/register-now, or call toll-free 1-855-850-3733, ext 202 to talk to Karen, Jennifer or Amy. Do it today! In case you missed it, I encourage you to read my e-letter column from last week about the benefits of using Gross Output (GO). I also invite you to comment in the space provided below. Headquartered in Hoffman Estates, Illinois, CDK Global, Inc. (CDK) provides integrated information technology and digital marketing/advertising solutions to the automotive retail industry worldwide. The company serves approximately 27,000 automotive manufacturers, retailers and original equipment manufacturers. CDK recently announced a comprehensive streamlining of its organization that will enable it to implement a major transformation plan.